IN ONE OFthe cities of Galilee where Jesus was teaching the people a Pharisee named Simon came to hear him. Like many of the other Pharisees, Simon tried to find fault with Jesus. Because he could neither see nor hear anything to criticize in Jesus, he decided to ask this teacher to take dinner at his house. There he would watch him closely, and possibly find something that would be wrong. 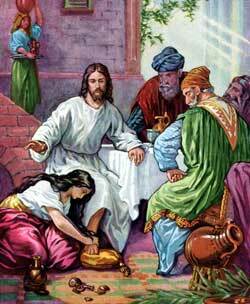 So Simon the Pharisee asked Jesus to come to his house one day, and Jesus went with him. Other people went, too, some who were invited and some who were not. And they all came into the dining-hall where the food was placed on the table. Around this table the guests were given room, while the uninvited persons stood back, looking on.